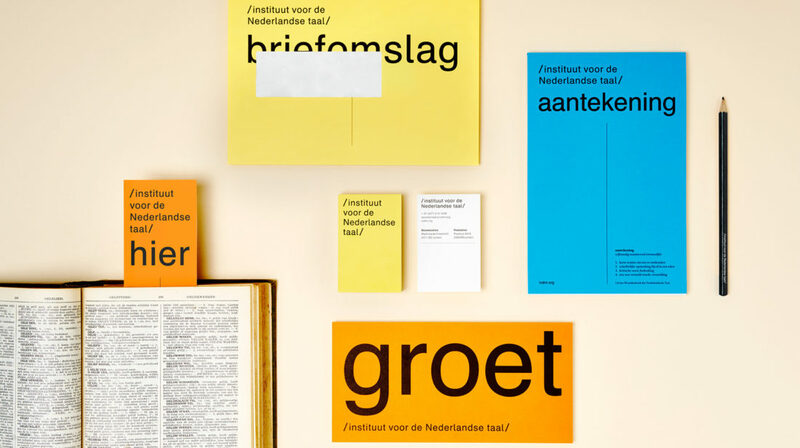 The Instituut voor de Nederlandse Taal (‘Institute for the Dutch Language’) researches and describes the Dutch language in all its aspects, such as vocabulary and grammar. The institute isn’t well-known among the public and it has an old-fashioned image. 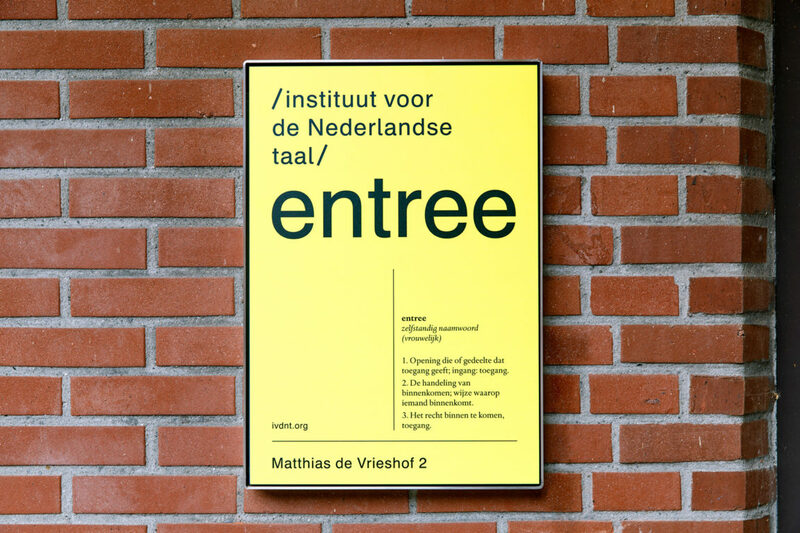 Therefore, the IvdNT would like to reposition itself as a modern institution that functions as a renowned source of expertise for the Dutch language. The idea was to incorporate the full name of the institute into the logo while keeping it applicable for diverse uses. We found a solution by using two slashes, or virgules. The virgule has both classical and contemporary associations. It is a punctuation mark of Latin origin, formerly used to divide words and indicate reading breaks. Nowadays, we know the slash mainly from web addresses. Because the virgules bookend the name of the institute, it can be broken into pieces and divided over several lines while remaining a clear and legible whole. For this corporate identity, we literally incorporated language – the institute’s field of expertise – into the imagery. By using words, communication is very clear and functional. The name of every form of communication – for example ‘poster’ or ‘brochure’ — is used as a tag on the object itself. Every tag serves both a visual and an informative purpose. The logo is used in combination with these image tags. 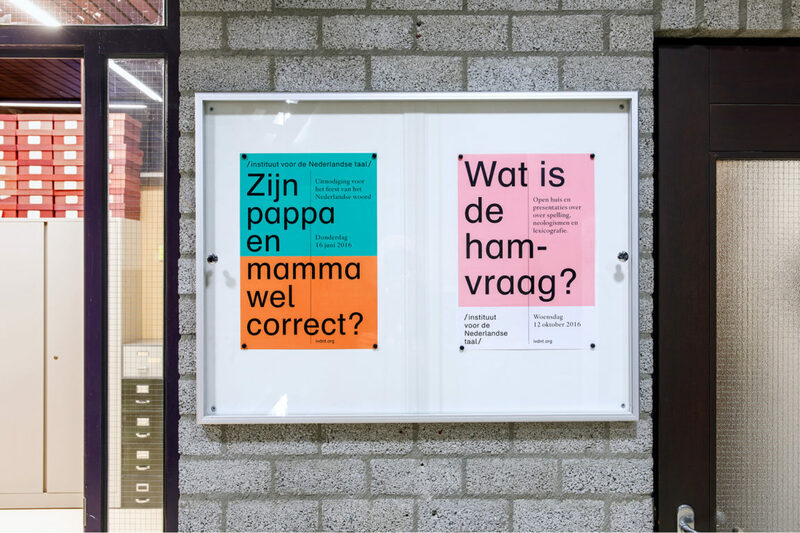 The identity can be embedded anywhere: on posters, routing and signing, correspondence and any printed matter. In all these different manifestations the tag represents the meaning of the word it stands for. This way, language becomes an integral part of the IvdNT’s visual communication, which fits the institute perfectly. We chose the Schulbuch Nord letter for the logo. 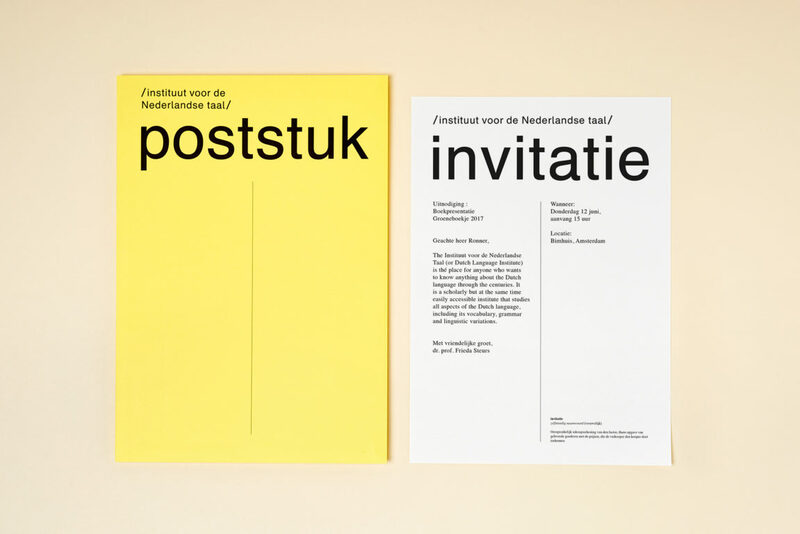 The letter, created by a Dutch type designer, has a modern look and is easily readable. 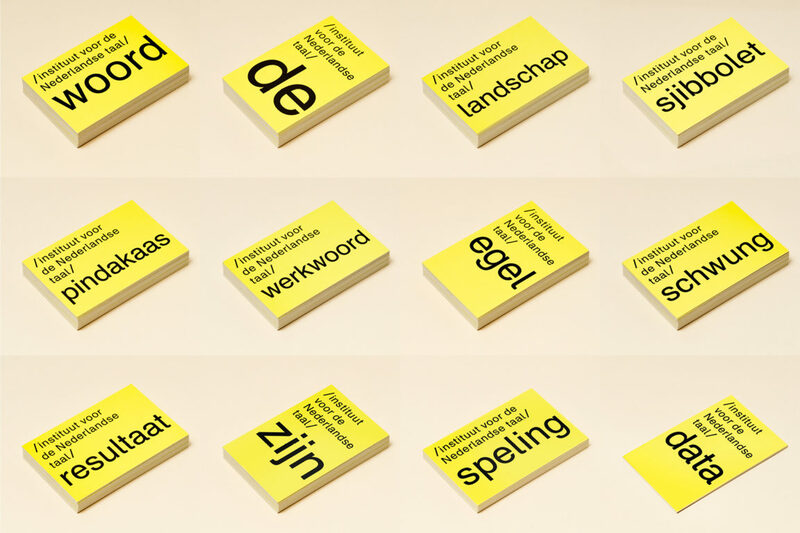 The Haarlemmer Pro letter – another Dutch design – functions as the basis for the tags. The graphic line (marker) can be deployed horizontically as well as vertically, which is a nod to the graphic language in a dictionary. The function of the marker is to explain words, but also to indicate a hierarchy. 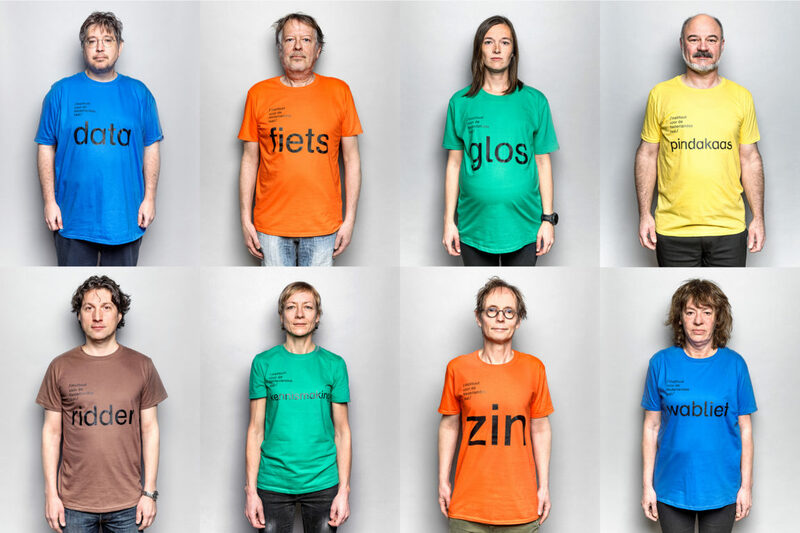 Studio De Ronners asked for the favourite words of all of the institute’s employees and applied them to personal business cards, t-shirts and other means of communication. This way, the identity also serves as a way to express the involvement of the employees.